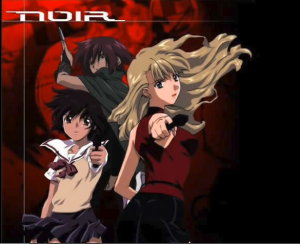 Flashback: “Noir”, an atmospheric anime – Nerdwatch! Back in the early 2000’s, I was just getting into anime watching heavily, and one of my favorite shows from that time was “Noir”, a mystery about two young women who work as assassins for hire. Their assignments mostly involved killing people who deserved to die, at least as determined by the ones hiring them, but there was also they recurring mystery of how they became killers, and what secrets of their relationship to each other and to their employers would be revealed. One of the girls was amnesiac, who woke up in a room in Japan with no memory, but with a school uniform and ID, and an innate knowledge of how to field-strip, clean and reassemble almost any gun. The other young woman initially worked alone using the code name “Noir”, but she encountered the other girl when both of them tried to kill the same set of gangsters. The younger girl ended up working with the older, and they ended up on various assignments throughout Europe and the Middle East, all the while learning more and more about who hired them and why, and what tied them together from many years earlier. What most added to the show for me was the atmospheric music of Kajiura Yuki, who wrote music that spanned several genres, but mostly faux-Medieval European music, such as the song in this video clip, “Salva Nos”. Also, there was a recurring theme, where the amnesiac girl had a musical watch which played a theme song that the other girl remembered from childhood. Ms. Kajiura played many variations on that theme throughout the show’s episodes, and it added a haunting current to the scenes of both violence and stillness. This was one of the first anime in the “girls with guns” genre, which led to two follow-on anime by the same production company, Bee Train, called “Madlax” and “El Cazador de la Bruja”, but with different characters and no relation plot-wise. Other anime in this genre include “Gunslinger Girls” and even parodies such as the currently running “Sabagebu”. This video clip is a music video of “Salva Nos”, with many action scenes from various episodes of “Noir.” Enjoy! Tagged assassins, Cantata, Kajiuura Yuuki, music box, Noir, Salva Nos. Bookmark the permalink.